The Missouri Mom: What is Piano Wars in Marquand, Missouri? What is Piano Wars in Marquand, Missouri? begin blowing up asking for more information. Piano Wars is like dueling pianos - musicians go match to match and the judges decide who is the best. Well the little town of Marquand and Homan Hall (along with several sponsors) take it a step farther - they make it a complete night out. When attending the Piano Wars at Homan Hall in Marquand you will be served a full meal catered by Durso Hills Winery & Bistro while you enjoy your entertainment. Now many have asked if this event is family friendly - ABSOLUTELY family friendly, however, I would be cautious what child I would take to the event. Not because I fear anything they may see or hear, but because little bitty kids have a hard time sitting still for long periods of time. You are the best judge at what your kids love and how long they can sit still. 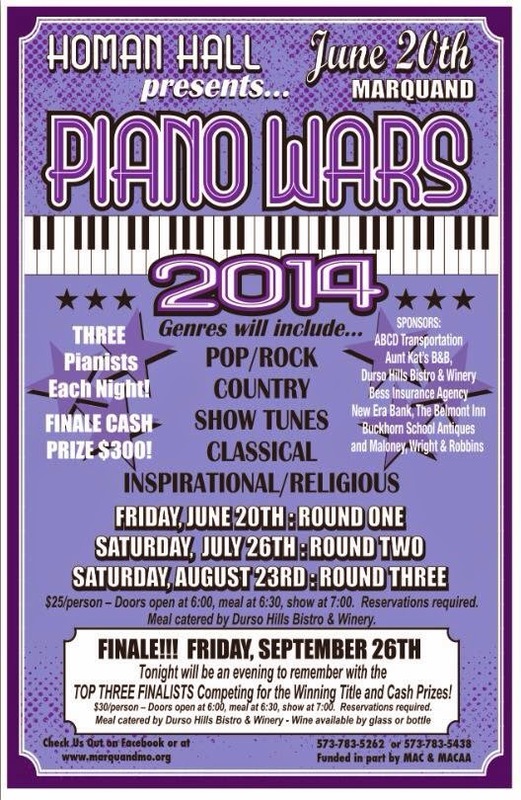 Piano Wars has three more upcoming shows - you can purchase tickets by calling 573-783-5262 or 573-783-5438.